Our first delivery of 2008! A delivery of all perennials, since the annuals are still getting established. We made the syrup in March and April, from the sap of the silver maples down by the river. The onions are perennial hardy bunching onions. 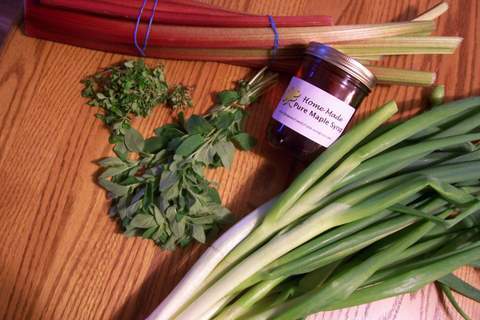 The rhubarb is either the regular or the redder sweeter “strawberry” rhubarb. The Oregano is the taller of the two herbs, and the Lemon Thyme is the more petite. This week also marked our first insect invasion– red and black turnip beetles that especially loved the spicy greens of the Arugula, Turnips, and Radishes. I spent Sunday picking them off and then covering what I could with row cover cloth to keep them out. Luckily, they also like a certain weed, so I am trying to entice them to leave the garden and stay over in that weed patch. As of Monday they had NOT re-invaded the greens, so here’s hoping it stays that way! Doing a little browsing on farm blogs, I came accross yours and greatly enjoyed it. I thought you might be interested in a blog I run, called http://www.aplaceintheauvergne.blogspot.com Under the first photo post of every day are articles from the International Herald Tribune concerning agriculture, food, and water. ‘Ian Walthew was a newspaper executive with a career that took him round the world, who one day did a mad thing. He saw a for-sale sign on a cottage in the Cotswolds, bought it, resigned and moved in. For the first few weeks he just lay on the grass in a daze. Then he started talking to his neighbours and digging into the rich history of this beautiful part of England. Out of his inquiries grew this affecting and inspiring memoir. ‘Having lived and worked abroad as a director of the International Herald Tribune for most of his adult life, Walthew, along with his Australian wife, Han, made a snap decision, aged 34, to buy a house in Gloucestershire, and embrace life in the country. This is familiar territory, but Walthew combines his own story – coming to terms with the untimely deaths of his father and brother – with that of the land and the people who make up village life. Good luck! I hope the beetles heed your advice and stay in the weed patch.